In this book, Gaby Thomson-Wohlgemuth explores the effects of ideology on the English-to-German translation of children’s literature under the socialist regime of the former German Democratic Republic. Giving prominence to extra-textual factors, the study undertakes a close investigation of the East German censorship machinery, showing that there was a close correlation between the socialist ideology propagated by the regime and the book selection process itself. Through an analysis of the contents of the print permit (censorship) files and the afterwords found in many books, Thomson-Wohlgemuth demonstrates that literature was re-written not only to placate the censor but also to directly guide the reader down the correct ideological path, both in the selection and interpretation of each translated text. 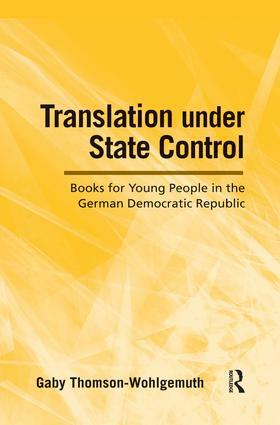 Thomson-Wohlgemuth begins this engaging study with a concise but thorough historical background of East German children's literature, setting the context for an examination of how the state and party operated to control the development of the genre. She highlights the fact that there was multi-level censorship at work, with the Unity Party propagating certain ideological literary policies, and the publishers self-censoring when selecting suitable texts for translation and publication. This book serves as an exemplary study of how publishers collaborated with the state in all Eastern European countries, and should be of interest to historians and children’s literature scholars alike.